We work to protect your personal information by using appropriate and generally accepted safeguards, procedures, and practices for both physical and online security. We partner with the IRS and state authorities to implement safeguards to protect your account. Read below for more information about the security features we use during the sign in process to help protect your account, the tools we provide to help you be aware of any use of your account, and what you can do if you have a concern about security. To verify your identity, we'll send a unique security code to your email or mobile phone when you sign in. Simply enter that code to authenticate your identity and access your information. Need help? Get fast answers to sign in questions. See all your sign in settings and choose how you want to protect your information in the My Preferences tile. Tailor how you authenticate your identity, update your security questions, and more. View a list of all sign in events and devices so you have full visibility into your account activity. We'll notify you if another user has already entered the same Social Security Number, helping you identify typos that could delay your refund and alerting you to possible pre-existing identity theft. 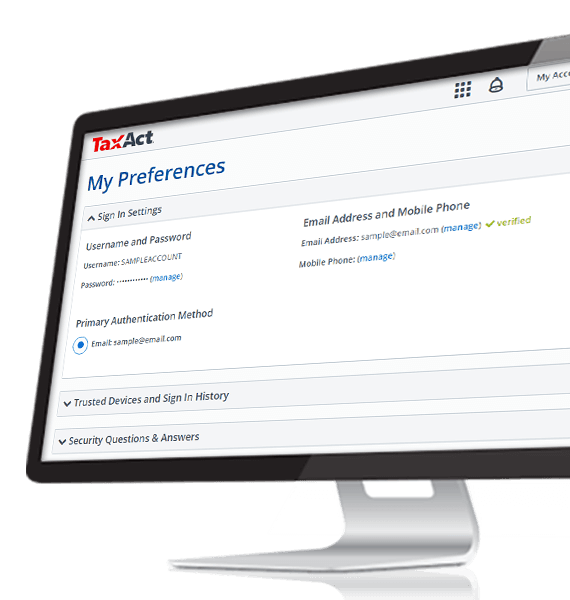 In addition to identity authentication, vigorous monitoring, and other security processes, TaxAct encrypts your data every time it's sent to us or the IRS. We use industry-standard Secure Sockets Layer (SSL) protocol which provides data encryption, message integrity, and server authentication. In addition, we take pride in being Payment Card Industry compliant, ensuring that your payment information is safe. For more information, see our Security Information page. Join the millions of customers who trust TaxAct every year.